When vegetarians cheat, they combine their love of Mexican cuisine with our fork-tender, fire-grilled steak. This classic southwestern rice bowl is both hearty and balanced. Our naked burrito bowl features fire-grilled steak & southwestern style vegetables with black bean rice, ranchero sauce and is topped with sharp cheddar cheese. COOKED ORGANIC RICE (WATER, BROWN BASMATI RICE), TOMATO GUAJILLO SAUCE (WATER, ORGANIC TOMATOES [ORGANIC TOMATOES, ORGANIC TOMATO PUREE, SEA SALT, NATURALLY DERIVED CITRIC ACID], ORGANIC TOMATO PASTE, GUAJILLO PEPPER PUREE [WATER, GUAJILLO PEPPER, CITRIC ACID], ORGANIC CANOLA OIL, ORGANIC ONION, ORGANIC CHICKEN BASE [ORGANIC CHICKEN MEAT AND JUICES, SALT, ORGANIC CANE SUGAR, NATURAL FLAVOR, ORGANIC DRIED ONION, ORGANIC POTATO STARCH, ORGANIC DRIED GARLIC, ORGANIC TURMERIC, ORGANIC SPICE EXTRACTIVES], ORGANIC SWEET BUTTER [ORGANIC PASTEURIZED CREAM], ORGANIC CHILI POWDER [ORGANIC SPICES, SEA SALT, ORGANIC GARLIC, SILICON DIOXIDE], SPICES, CORNSTARCH, CHIPOTLE ADOBO PUREE [WATER, ONION, DRIED CHIPOTLE PEPPER, TOMATO PASTE, CANOLA OIL, SUGAR, VINEGAR, SALT, GARLIC PUREE, NATURAL SMOKE FLAVORING, WHITE PEPPER, OREGANO, BAY LEAVES], ORGANIC CANE SUGAR, ORGANIC GARLIC), COOKED SEASONED BEEF (BEEF, WATER, SOY SAUCE [WATER, SOYBEANS, WHEAT, SALT], LESS THAN 2% NATURAL FLAVOR, SALT, DRIED CILANTRO, LIME OIL), COOKED ORGANIC BLACK BEANS, ORGANIC CORN, POBLANO CHILE PEPPERS, ORGANIC RED BELL PEPPERS, ORGANIC WHITE CHEDDAR CHEESE (CULTURED PASTEURIZED ORGANIC MILK, SALT, ENZYMES), ORGANIC CANOLA OIL, ORGANIC CILANTRO, LIME JUICE (WATER, LIME JUICE CONCENTRATE, LIME OIL), SEA SALT. All of our entree meals are made with a minimum of 70% organic ingredients. We believe food should taste like nature intended, so we make every effort to avoid pesticides and herbicides, sourcing our ingredients organically whenever possible. It’s not just better for people and the planet, it results in better tasting meals for you. Animal welfare matters to us. Not just because it makes for happier animals, but it makes for healthier food. That’s why we never use antibiotics, hormones or animal byproducts. And we use only cage-free eggs. Decisions we think add to the flavor of our meals, and our collective good conscience. 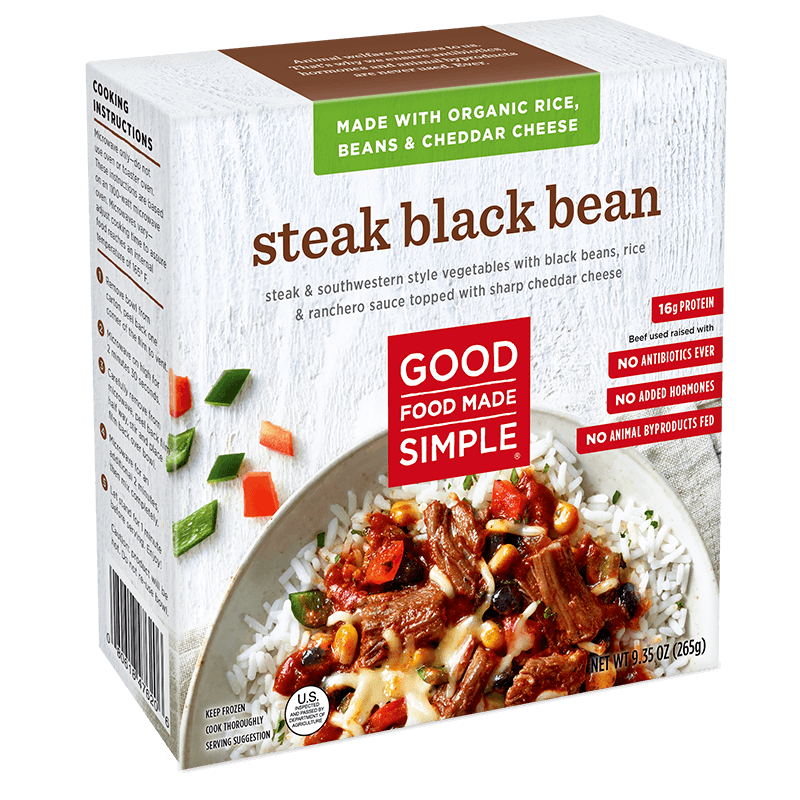 Our meals are made with simple ingredients you would find in your pantry or fridge, and nothing artificial. We do not use artificial ingredients, colors or flavors. And we never use chemical preservatives, fillers and MSG. Our entree meals take your taste buds on a global epicurean adventure, with ingredients sourced locally. These tasty entrées take the time out of mealtime, deliciously.